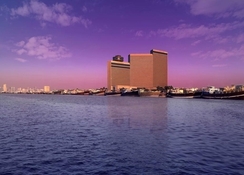 The modern Hyatt Regency Dubai is on the Deira Corniche at the mouth of the Dubai Creek, overlooking the Persian Gulf. The Gold Souk is within walking distance and the luxurious Hyatt Regency Dubai is just two minutes from Deira’s commercial and shopping area. The hotel has 414 rooms and suites decorated and furnished in a modern style using hardwoods, marble and natural colours. Rooms have marble baths, high speed internet access, bathrobes and slippers, air conditioning and satellite television. 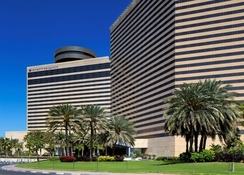 The Hyatt Regency Dubai has a Club Olympus Fitness and Spa complex, an ice rink and tennis courts as well as an outdoor swimming pool. The fitness and spa area has a beauty salon, gym, sauna, steam room, jogging track, plunge pool and Jacuzzi as well as a selection of body treatments, massages, facials and skin care. Tennis lessons, swimming lessons, aerobics and personal trainers can also be arranged. Guests will also find all the usual facilities at the hotel including 24-hour reception and room service facilities, laundry and dry cleaning services, a supermarket and shops, parking and internet access. Whatever your wining and dining requirements are you will surely find something suitable here. Not only is the hotel home to Dubai’s only revolving restaurant where you can enjoy great views of the surrounding area, the hotel also has Italian, Japanese, and Iranian cuisine amongst others. 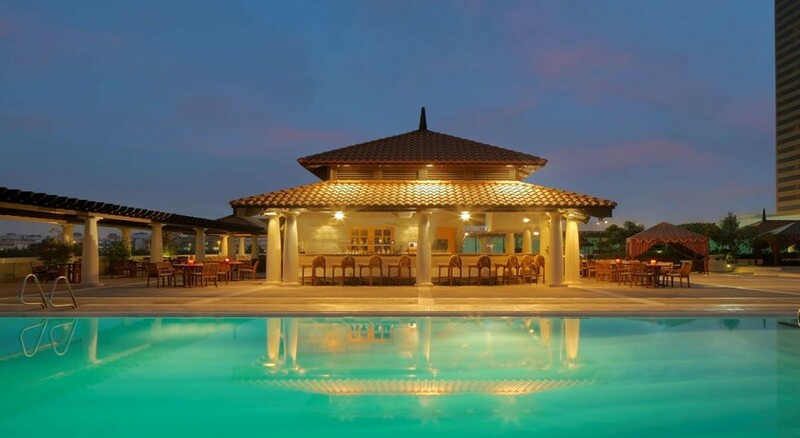 For refreshments, hot and cold, alcoholic and non-alcoholic, there are numerous venues including a coffee shop, a poolside bar and a 24-hour bar and lounge. The hotel is also home to Dubai's liveliest night spot. The hotel has top international DJs provided by a London based company for entertaining the guests. Located in the heritage district – Dubai Creek, the Hyatt Regency Dubai is within walking distance to the spice, gold and textile souks. This modern high-rise hotel is just 11km from the Dubai International Airport and 3km from the cruise terminal. 414 rooms are spread over many floors on this property, each enjoying an elegant and inviting design with modern aspects. Each room offers; phone, iPod docking station, flat-screen TV, air-conditioning, private bathroom, hairdryer, designer toiletries, minibar, in-room safe and Wi-Fi access. Please note: All view rooms also include complimentary internet access. The hotel has Dubai’s only revolving restaurant on the 25th floor and features spectacular views of the Arabian Gulf, the Creek and the city of Dubai. There is also a popular Italian restaurant, a contemporary Japanese restaurant, an impressive Iranian restaurant and the stylish 24-hour kitchen restaurant, where diners can enjoy Middle Eastern, Asian and Western inspired foods, while watching the expert chefs at work. The hotel also has several bars including one with great views, a 24-hour lobby lounge, a karaoke bar and a poolside snack bar. There is a coffee shop located in the Galleria Mall where you can enjoy muffins, sandwiches or cakes for a quick snack or while watching the happenings on the nearby ice rink and finally there is The Premiere, one of Dubai’s liveliest nightspots. Here guests can enjoy delicious drinks and groove to the latest songs at the disco. The hotel offers ample sports and entertainment facilities to its guests. There is an outdoor pool, where you can relax in the sun. It is one of the few hotels in Dubai that facilitates ice skating. You can have fun in the glittering winter land and beat the heat or sit near the ice rink and watch the skaters while you have refreshing beverages and delicacies. You can maintain your fitness level in the 24-hour Club Olympus Fitness centre, which is exclusively available for the Hyatt Regency’s guests. For ultimate pleasure and rejuvenation head to Club Olympus that offers multiple treatments including body massages, body wraps and scrubs, facial treatments, healing massages and much more.